Witch County nefarious frights DEVILMENT – led by vehement frontman Dani Filth, will release their forthcoming masterpiece Devilment II: The Mephisto Waltzes on November 18 via Nuclear Blast Entertainment. The band have released the first official music video for "Hitchcock Blonde", and you can watch it now on KNAC.COM right HERE. The video was directed by Sam Scott Hunter with a skeleton crew of academic students, with thanks to Film Suffolk. It features actress Leanne Joyce as the Hitchcock Blonde, who has appeared on Britain's Next Top Model, Call The Midwife and The Royals to name a few. Dani comments: "This is all about the legendary film director Alfred Hitchcock's infatuation with his on-screen heroines; cool, controlled, aloof and sophisticated blondes. The song even name-checks ten of his favourite actresses. As ever there is a psychotic bend to the lyrics and the accompanying video, which was shot in a derelict, haunted hotel in the middle of Ipswich (the band’s home town) where Lord Nelson was said to have stayed on numerable occasions. The various hideous frights throughout the video were past denizens of the hotel captured on camera." 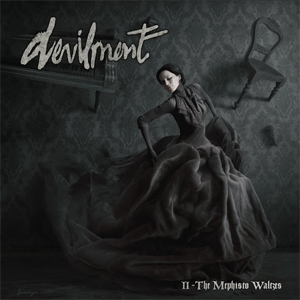 Pre-order Devilment II: The Mephisto Waltzes HERE. "Life Is What You Keep From The Reaper"